This week's topic immediately reminded me of the Biblical parable of the shepherd who went to seek his one lost sheep, leaving the ninety-nine behind. 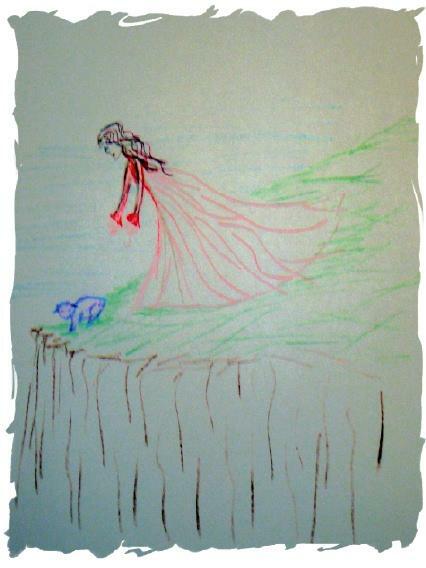 So I drew a shepherdess, reaching for her sheep (because, I am after all, a girl! ), to remind myself of the purpose of my life. 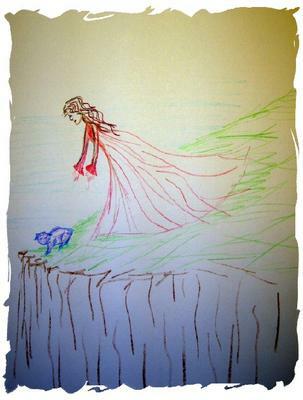 After I drew it, I was reminded of the verse: "...and of some, having compassion..." Imagine the compassion to leave ninety-nine sheep who are safe and warm at home, and go out into the wilderness just to find one sheep, who you may or may not be able to rescue. To spend your time seeking, with no promise of success. It's much like life - you spend your time dealing with people you may or may not be able to help. (Much like teaching too!) It takes compassion to make us leave the comforts of home, the familiarity of the "ninety-nine," and search the cold night for just one...never knowing quite where to look, or where you may be of help, but just "being available" when there is a need. But, of course... there was One who went looking for us too... when we needed it - so it's only right to follow in His steps. On a technical note... I only have my 89 cent Ocean State Job Lot set of 12 colored pencils, and I didn't know what color to make the sheep, so I picked purple. And I'm not very good at drawing "in the lines...." Mostly I just like to draw the curly hair - it's the most fun part of the illustration! (and the easiest). If anybody knows how to pick the right colors, let me know! :) I was thinking I'd like to try drawing with chalk sometime... it seems like it would be more forgiving than colored pencils! Sorry if the picture is too small to see also... And I need to work on getting the scanner going, b/c taking a digital photo of the artwork and uploading it creates a lot of shadows and a beige hue to the page. Oh well - technicalities, I suppose! Sometimes your technical difficulties can HELP the overall composition. In this case, I think the shadow-blue tint near the bottom and beige tint up top help to create a dark/light contrast... further illustrating the plight of the sheep. It's being rescued from darkness and loss back to light. Wow - I never looked at it that way... I have a lot to learn about drawing! This is only my 2nd illustration in my life! :) Thanks for the post! We had a similar idea on this one - I like your drawing and your writing. Keep it up!! Wow, for a second illustration, you have a great concept of focal point and compositon. Don't feel bad about the lack of technology at your disposal; a lot of the illustrators I know still do their conceptualizing on paper. This really is a great illustration.